Construction of U.S. Bank Stadium is Substantially Complete and the building is ready for business. Finished six weeks ahead of schedule, the new stadium and home of the Minnesota Vikings features a bold, iconic design unique to Minnesota, fan-friendly elements and unmatched technology that make it a special NFL venue. Contractor Mortenson Construction symbolically turned over the stadium's keys to the Minnesota Sports Facilities Authority (MSFA), the building's owner, and the Minnesota Vikings today during the MSFA's June board meeting. U.S. Bank Stadium is complete six weeks ahead of schedule. Substantially Complete is a contract term in the construction industry that establishes when construction is finished except for minor remaining work, and the building can be used for its intended purpose. U.S. Bank Stadium was originally scheduled to reach this milestone on July 29. "Mortenson Construction has done a phenomenal job keeping us ahead of schedule while building the most amazing stadium in the United States," said Michele Kelm-Helgen, Chair of the Minnesota Sports Facilities Authority. "Mortenson took building the largest transparent roof in North America and the largest operable doors in the world in stride, and succeeded. We are proud to be their partner." The architectural landmark is 1,750,000 square-feet and cost $1.1 billion to build. With seating for up to 70,000, the stadium features a fixed-roof design with the largest span of transparent ETFE material in the country; five large glass pivoting doors; zinc metal exterior panels; the closest seats to the field in the NFL; seven levels connected by stairs, ramps, escalators and elevators; the first NFL stadium built with LED lighting; increased and enhanced concessions; 2,000 HD flat screen TVs; and two concourses with 360-degree circulation and various views into the bowl. "Today's achievement is an incredible feat by HKS, Mortenson Construction, the MSFA and the Vikings, as well as the hundreds of subcontractors and thousands of Minnesota men and women who worked on this project over the last two and a half years," said Vikings Owner/President Mark Wilf. "U.S. Bank Stadium was designed with the fan experience as the number one priority, and to accomplish this milestone ahead of schedule is a testament to the talent and dedication by so many." The construction of U.S. Bank Stadium set a new standard for sports facilities. Followed by a groundbreaking ceremony on December 3, 2013, the stadium was built in two-and-a-half years, several months shorter than originally projected, and for less than other similarly-sized sports facilities. The project also achieved unparalleled workforce participation and local business involvement that far exceeded the established goals for the project. More than 8,000 workers have committed more than four million hours on the project to date. The City of Minneapolis issued the building's certificate of occupancy a month-and-a-half early on June 3. "The stadium stands as a testament to the dedication, expertise, and hard work of so many in the local construction industry," said John Wood, Senior Vice President at Mortenson Construction. "Mortenson would like to recognize architects HKS for such a magnificent design. 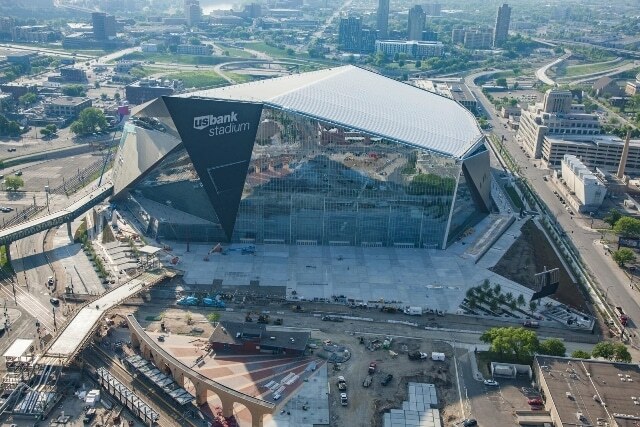 U.S. Bank Stadium is the premier stadium in the NFL, and, on behalf of the entire project team, we are proud to hand over the keys to this amazing new facility six weeks early." Following the official ribbon-cutting and grand opening ceremony on July 22, U.S. Bank Stadium will host free public open houses on July 23 and 24, including a weekend-long, family-friendly festival. The first sporting event at U.S. Bank Stadium will be AC Milan v. Chelsea F.C. on Aug. 3 as part of the 2016 International Champions Cup and back-to-back concerts by Luke Bryan and Metallica will take place on Aug. 19 and Aug. 20 respectively. The Minnesota Vikings 2016 home opener is Sept. 18 vs. the Green Bay Packers. U.S. Bank Stadium will also host Super Bowl LII in 2018 and the 2019 NCAA Men's Final Four.